To apply for a position, please fill out the attached application and email to contact@urbancsa.org by Friday April 3rd. Descriptions of positions can be found here. We look forward to receiving all applications! The annual festival Modernism Week which takes place in Palm Springs, California, is a celebration of Mid-Century Modernism spotlighting its prominent architecture and design, as well as art, fashion and culture. This year’s event lasting from February 12th to 22th, marked its Ten Year Anniversary, featuring over 100 events. It included signature home tours, film screenings and lectures, Premier Double decker Architectural bus tours, as well as sale and exhibitions of art and furniture. Not to mention classic car show and private pool parties hosted by the very owners of mid-century modern residences. The event headquarters were located at Community Meeting Place cleverly named CAMP, situated at the most vital city’s street-Palm Canyon Road. Iconic Walk of Stars dedicated to Richard Neutra, Frank Sinatra’s ‘Twin Palms’ Estate Tour and The Christopher Kennedy Compound were a couple of many remarkable sights. Other tours included homes designed by A. Quincy Jones, Albert Fray, Donald Wexler, E. Steward Williams, Hugh M. Kaptur, William F. Cody and William Krisel. 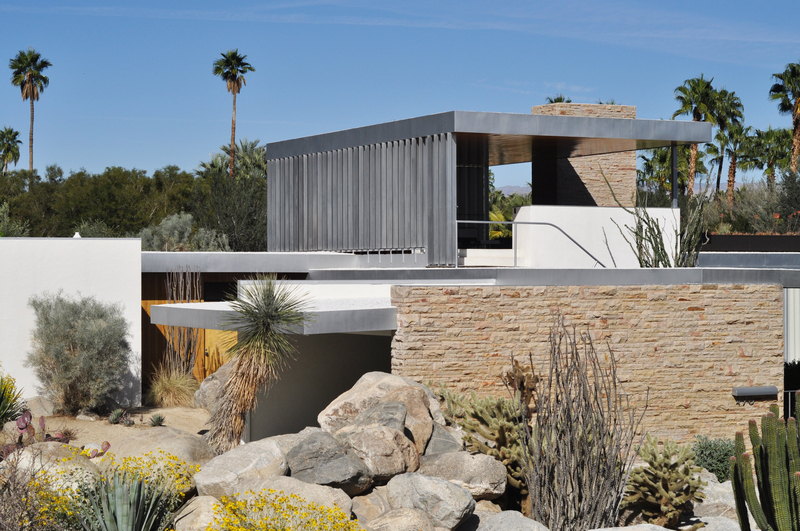 Special release for Modernism Week 2015 was the book “Desert Modernists-The Architects who Envisioned Midcentury Modern Palm Springs”, that includes architects mentioned above as well as others who through their visions and work, made Palm Springs a centerpiece of mid-century modernism. After the desert sun got replaced by the star-filled sky, event guests and the city’s residents enjoyed Illuminated Modern installations showcasing renowned local architecture, displaying names of their exceptional creators and dates of construction. One of the most compelling events for a student interested in city planning and architecture was the symposium Urban Vision and Public Space, hosted by the Palm Springs Art Museum Architecture and Design Council. Panel presentations focused on planning and design solutions providing aesthetic, healthy, community engaging and connecting environment fostering economic benefit and sustainability. Keynote speakers included Charles Montgomery, broadly recognizes author of the book “Happy City: Transforming our Lives Through Urban Design” who is currently residing in Vancouver. As well as Marry Margaret Jones, a senior Principal in Charge of Hargreaves Associates, responsible for projects such as Year 2000 Sydney Olympics Master Concept Design, who is also currently leading the design of Destination Bayfront in Corpus Christi project in Texas. Panel discussion included Palm Springs City Planning Director, The Executive Director of the Agua Caliente Cultural Museum and Chair of local Planning Commission presenting historic overview and city planning issues Palm Springs is facing today. Modernism Week is not only an enjoyable event elevating the aesthetic elegance and excellence of local architecture and its creators, it also strives to engage city’s guests and residents in contemporary thinking, stimulating preservation and sustainable modern living. Last year’s event estimated the economic impact bringing $17 million to Palm Springs; more than $219,000 of revenue generated by neighborhood tours was given back to communities to assist with improvements of landscaping, restoration, and retaining authenticity. Modernism Week is a nonprofit as well as charitable organization. It encourages education and provides scholarships for local prospect students interested in Architecture and Design, and also includes grants issued to Preservation Organizations of California’s modernist architecture. Students will have the opportunity to meet with professionals and other stakeholders to discuss secondary suites legalization. Snacks and refreshments will be provided.